The state of FOIA and public records law has been on a rocky path the last couple of years. The Department of Justice’s Annual FOIA report for FY18 shows a backlog of requests across all federal agencies. Even more alarming, state record laws continue to face insurmountable threats with legislative attempts to restrict access and infringe on the people’s right-to-know. 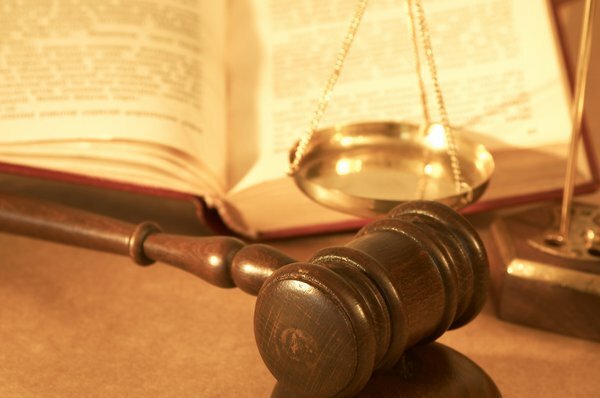 Although the people’s right, many state and local agencies have been found guilty of record law malpractices prompting requesters to take matters into court. Yet, other small town localities have proved that fulfilling records request can be quick and painless. In order to get a better sense of what’s truly going on with public records laws, we decided to take a look at over 2,600 agencies in MuckRock’s API, focusing on those that had received of three or more filed requests thru the site. The numbers show the staggering differences in state and local average response times as well as the number of requests filed and completed in those states. On the state front, our data pointed to Massachusetts, California, and New York as the top three states with the highest number of request filed through the platform. However, completed requests in these states were well under half the number of all filed requests. MuckRock requesters have filed 4,208 requests with Massachusetts agencies that meet our criteria, but only 1,598 requests have been completed. 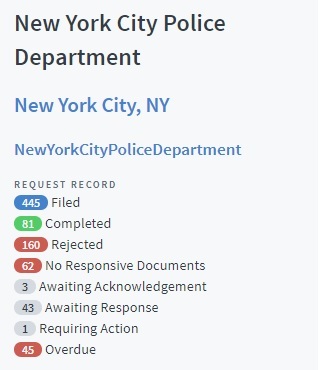 That leaves over 2,000 pending requests in a state with a required ten day response time for agencies. A deeper look into bay state agency’s shines a light on the state’s records backlog. 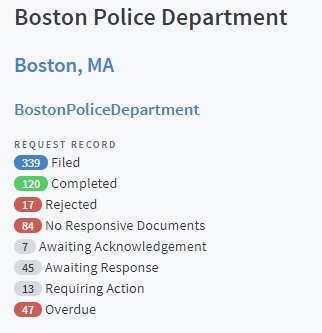 The Boston Police Department alone has 52 pending requests, 48 of which are overdue. It’s no surprise requesters face difficulties in a state hailed as one of the country’s most restrictive public records law. Criticism for the state’s record law continues, even after the state’s efforts to strengthen the law. On the other side of the country, MuckRock requests to those agencies in California totaled at 2,917, making it the second most requested state on the site. But like Massachusetts, California has completed under half of its requests. Only 1,170 requests have either been fulfilled or rejected by state and local agencies across the Golden State. The California Public Records Act also requires agencies to respond to records requests in ten day business days, but offers no appeal system if requests get rejected. New York ranks as the third most requested state with 2,225 requests to those agencies. However, New York isn’t up to par with the other two top states, as, it’s only completed 855 of its requests. The state is also home to the country’s largest law enforcement department, which has 46 pending requests, 45 of which are overdue. Under New York’s Freedom of Information Law, agencies are required to acknowledge a request within five business days. Although the most popular states for MuckRock requesters, these three are not among the state’s with the longest response times. Oregon earns its spot as the worst state at responding to requests, with an average response time of 148 days. The long wait is no doubt is connected to the law’s unclear response time limit, which causing major problems with appeals. In second place, Iowa makes the list with an average response time of 121 days. While the law does have a 20 day response time limit, it’s not strictly enforced, and similarly, agencies aren’t required to tell you if your record search will take more time to fulfill. Lastly, Texas holds the third spot with an average response time of 95 days. The Texas Public Information Act allows agencies to fulfill requests “promptly” or within the estimated timeframe of ten days. Plus, the state’s Attorney General can slow down the entire process as all exemptions and rejections have to go through the AG’s “pre-appeal system,” which often can take longer than ten days. Even if requests does exceed the ten day timeframe, there is no process for appealing fees or request delays after the AG’s ruling. On the other end of the spectrum, jurisdictions like Vermont, Idaho, and Rhode Island have an average response time of less than 15 days each. 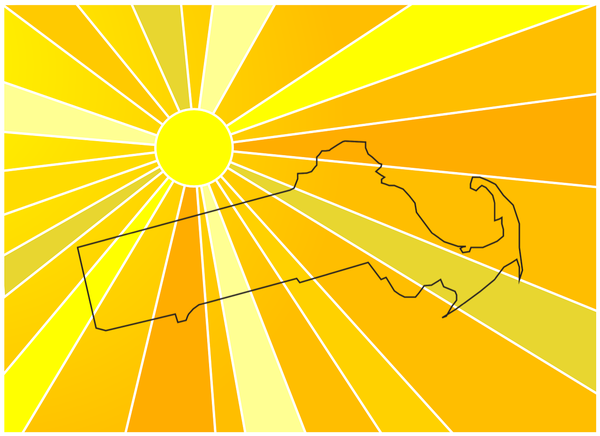 The Vermont Public Records Act calls for a three-day response, which can be credited for the state’s 11-day average response time. Idaho also has an 11 day average response time, but its records act allows 20 days for a response. That’s pretty surprising considering the fact that there is no strict enforcement for the 20 day time frame, nor is it mandatory for agencies to tell you if your request will require more time than expected to complete. Rhode Island comes in at an average response time of 12 days despite its weak enforcement of the law and highly specific fee rules. We’ll continue to look at our data to find out what’s happening with public records law across the country. In the meantime, take a look at our state of state public records law project for more on the current state of your law. Plus, if you have your own records struggle, let us know via the form below!